DSN TULSA's RETAIL STORE SPECIALS ONLY! If you are in the Tulsa area and are looking for great deals, Discount Sport Nutrition is the place for you! We have a wide variety of name brand supplements that will help you achieve your goals faster! Come check us out at 6636 S. Memorial Dr. 74133. It is in the same shopping center as Genesis Gym, formerly known as Gold's Gym. Across the street from Woodland Hills Mall at 66th & Memorial. 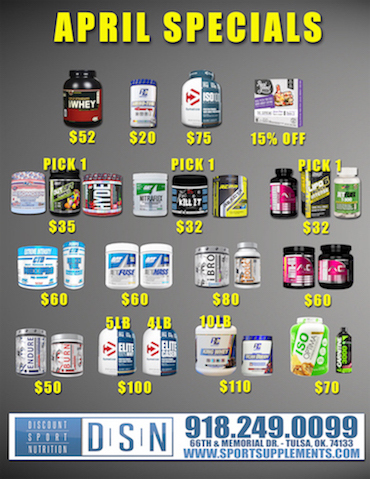 Here are DSN Tulsa's Top Supplement Specials. For More Product information, just use the search bar at the top of this page! Real Good Protein Pizza 15% OFF at DSN Tulsa Retail Store! For the Top Bodybuilding Supplements and Nutritional Products, shop at Discount Sport Nutrition in Tulsa. Tulsa's only deep discounted supplement superstore. We carry all the top quality major supplement brands at true discounted prices. Give us a call, email us or visit us online for anything you need! Discount Sport Nutrition - Tulsa's #1 Supplement Superstore!